Custom-designed stand mixers. The coolest appliance you’ve seen all day. What good is a Gadgets channel if we can’t tell you about the cool stuff that we find from time to time? 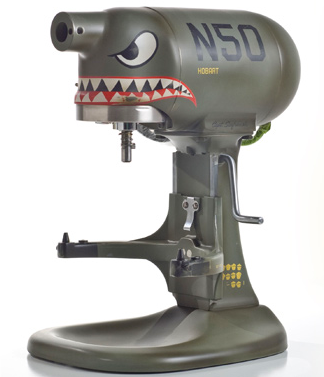 In view of that fact, we present to you today the coolest stand mixer you’ve ever seen, from Mixed Up Jake. Now, refurbishing and custom-painting kitchen appliances isn’t something that you learn to do in any school. Jake Murphy is simply an art school graduate with a penchant for cooking and creating. Bearing that in mind, he went took up the hobby of refurbishing the old monsters into something more beautiful than before. So a few months ago I came across a vintage mixer from the 70’s that was just begging for a new coat of paint. It was free and I had some time on my hands. A few weeks later I had modded it into a piece of hard working kitchen art. My friend saw it and just had to have it for his bakery. A few more guys saw his and the next thing I know, I’ve got a list of people that want me to customize mixers for them. Once I got a few under my belt I started thinking maybe I could make a business out of this. And make a business he has. By refurbishing Hobart mixers, he’s not only giving new life to the old appliances but adding beauty to your kitchen as well. Bear in mind though that this pretty face doesn’t come cheap. You can choose to customize your own from some pre-determined patterns but it will set you back a cool $2,500. The up shot? Once you’ve designed your mixer you can share it on Facebook and be the envy of your friends. Dig that? You’ll love the things you find here.